Tarawih is the twenty Rakat Namaz that is Sunnat-e-Maukida and is prayed in the month of Ramadan after the Farz Namaz of Isha every night. The time of Tarawih is after praying the Farz of Isha until the beginning of the break of dawn [Hidaya]. In Tarawih the Jamaat is Sunnat-e-Kifayaa, meaning if all the people of the Masjid missed it then they would all be responsible for the sin and if one person prayed at home alone then he has not committed a sin [Hidaya, Qazi Khan]. Subhaana zi alMulk wa alMalakoot; Subhaana zi alIzzate wa alAzmate wa alHaybate wa alQudrate wa alKibraaye wa alJabaroot; Subhaana alMaleke alHayye alLazzi la yanamu wa laa yamoot; Subboohun Quddoosun Rabbanaa wa Rabbu alMalaakate wa alRooh; Allahumma ajirna min alNaare ya Mujeeru ya Mujeeru ya Mujeer. It is Mustahhab to delay it until one third of the night has passed and if you wait until half the night has passed then there is no harm [Durr-e-Mukhtar, Bahar-e-Shariat]. Just as the Tarawih is Sunnat-e-Maukida for men, in the same way it is Sunnat-e-Maukida for women and they are not allowed to miss it [Qazi Khan]. The twenty Rakats of Tarawih are to be prayed in two, two Rakats i.e. performing salaam after every two Rakats and therefore in total ten salaams. After every four Rakats it is Mustahhab to rest for the duration it took to pray the four Rakats, this rest is called Tarwih [Alamgiri, Qazi Khan]. After the Tarawih has finished the fifth Tarwih is also Mustahhab. If the fifth Tarwih is a burden on people then do not do it [Alamgiri, etc.]. There is flexibility in Tarwih, whether you remain quiet or you can pray some Tasbeeh, Quran, Durood Sharif or Dua and if he wished he can pray Nafl alone, but to do this with Jamaat is Makrooh [Qazi Khan]. Those who have not prayed the Farz of Isha cannot pray the Tarawih nor Witr until he prays the Farz. Those who prayed the Farz of Isha alone can pray the Tarawih with Jamaat but he must pray the Witr alone [Durr-e-Mukhtar, Radd-ul-Mohtar]. If you have prayed the Isha Farz with Jamaat and then prayed the Tarawih alone, he can join the Jamaat for Witr [Durr-e-Mukhtar, Radd-ul-Mohtar]. 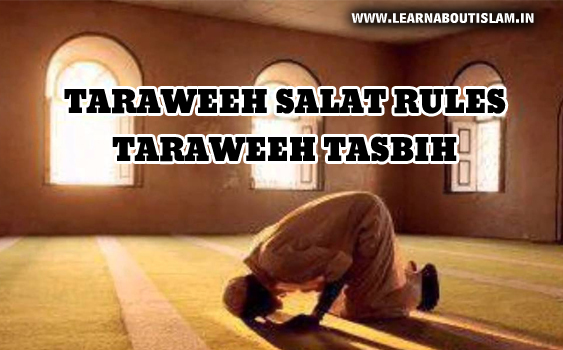 If you have some Rakats of Tarawih left and the Imam has stood up for Witr then it is better to pray the Witr with Jamaat as long as you have prayed Isha Farz with Jamaat and then you can pray the remaining Rakats of Tarawih. It is also allowed to complete your Rakats of Tarawih and then pray Witr alone [Alamgiri, Radd-ul-Mohtar]. If people have prayed the Tarawih and now they want to pray it again then they can pray it alone but it is not allowed to pray it with Jamaat again [Alamgiri]. If one Imam prays Tarawih in two masjids and if he prays the full Tarawih in both masjids then this is not allowed. If the Muqtadee prays the Tarawih in full in both masjids [hen there is no problem, however, he is not allowed to pray Witr again if he has already prayed in the first masjid [Alamgiri]. It is better to pray the Tarawih with Jamaat in the masjid. If the Tarawih is prayed in a house with Jamaat then you will not get the sin of missing Jamaat as it will still be counted but the reward will be less than praying in the masjid [Alamgiri]. The Tarawih prayed behind a child will not count for any adults who prayed behind the child [Hidaya, Durr-e-Mukhtar, Alamgiri]. In the whole month of Ramadan to finish the Quran once is Sunnat-e-Maukidah and to finish it twice is virtuous and to finish it three times is a good thing. You should not miss this opportunity just because people are idle [Durr-e-Mukhtar]. To give a Hafiz a salary for praying the Tarawih is not allowed and the giver and taker are both sinners. A salary is not just a fixing of the fee such as I will take this much for praying the Tarawih or I will give you so much for praying the Tarawih, but if a Hafiz believes he will pray at a certain place he will get so much then this is also not allowed. If the people say we will not give you anything or the Hafiz says I will not take anything and then the public decide to give the Hafiz a gift or some money as a gesture to thank him for his efforts then there is no problem with this [Bahar-e-Shariat]. Shabinah meaning to finish the whole Quran in one night in Tarawih. During today's era where a Hafiz prays the Quran at great speed that the words cannot be understood. Never mind praying the words where the pronunciation is done correctly the listeners are also in a state where some are sat down, some are lying down, some are even sleeping and some perform the Takbeer-e-Tahmnah when the Imam goes into the Rukooh and then they are doing this very quickly, in all these situations the Shabinah is not allowed. If the Hafiz prays speedily to pose off then this is Haram and is a sinner.